There are numerous important food revolutions currently taking plcae, from defeating GMO and biotech to exposing pharmaceutical and food manufacturer frauds, to becoming more food sovereign. 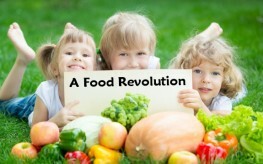 While these movements are direly important, one food revolution which deserves more focus is the way we feed our children, especially while they are in school. Jamie Oliver has gone to great lengths to educate both children and adults about the effects of diet on our children’s well being, and it doesn’t just whittle the obesity rate. The Food Revolution started when Oliver began to notice how completely disassociated school aged children were from their food. Many couldn’t tell the difference between a potato and a tomato, though they could certainly tell you where their local fast food joint was. Some didn’t even know that French fries came from potatoes. A majority had no idea what ‘fresh’ healthy food even looked like. If you think about it, our eating habits for life often stem from our earliest relationships with food. This is why food manufacturers spend billions to advertise to the young and impressionable. One interesting documentary describing the growing obesity epidemic among youth in our country, entitled Tipping the Scales, states, “it is said that this generation will not outlive their parents.” It’s a sad commentary on what we’ve become.
. Even celebrities are getting in on the action of educating our youth and making eating healthy ‘vogue’ as a counter measure to the animated cookies and candy, sports drinks, and soda campaigns that are their ever-companions. Kevin Spacey recently did a short clip in support of Jamie Oliver’s food education and revolutionary campaign – to change what we feed kids in school cafeterias across the country. We can preach no-GMO until we are blue in the face. We can petition and complain for years, but until we start changing our own eating habits and making darned sure we are putting nutrition-less crap in our kid’s lunches, we will continue to see a healthcare crisis in this country like we’ve never known before. Kids are getting more obese every year. Without counter measures, this problem spirals out of control. As Let’s Move points out, obesity rates have tripled in children recently, but we can’t just ask them to get busy jumping rope on the playground or to study for their spelling tests if we aren’t giving them a diet that supports these actions. One journalist, nominated for a Pulitzer prize points out the dramatic changes at a school that dared to go against the food and medical plutocracies. In a piece titled A Miracle in Wisconsin, he details the confounding truth about what happens in Appleton, Wisconsin when a high school got rid of vending machines, sodas, and packaged foods for lunch and started serving salads and a healthy lunch through a program called Natural Ovens. Kids stopped packing weapons. Attendance rates shot way up. Kids started paying attention to their teachers in class and being able to concentrate on their schoolwork. Discipline problems that once swamped the principal all but evaporated. They didn’t hire armed guards or add extra metal detectors; they just started serving healthful food. As mindful individuals try to educate the masses about the importance of nutrition, we can stand by, chomping on our brain-damaging fast food meals or we can get with the surge of necessary change and add to the momentum of this movement. There are a thousand ways you can get involved. You can garden with your kids, cook with them, get physical with them, and help at a community garden. You can pack healthful lunches for them and help them to observe how they feel when they eat well and how they feel when they don’t so they can make smart choices going forward. There a thousand ways to get involved. Now that’s radical.